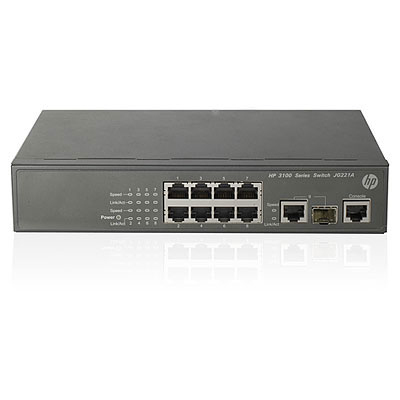 The HP 3100 SI Switch Series is a low-cost Fast Ethernet switch line that enables organizations to do more with less. Stackable and affordable, this series comprises intelligent, network-manageable Layer 2 Fast Ethernet switches that offer high performance, high port density, and easy installation. These switches provide 10/100 Mbps downlinks and Gigabit Ethernet uplinks, and offer link aggregation that expands bandwidth and enhances connection reliability. In enterprise networks, they can serve as access devices for 100 Mbps-to-desktop applications. In metropolitan area networks (MANs) or industry networks, they can connect end users or aggregate low-end switches through 100 Mbps electrical interfaces in the downlink direction, converging at an IP switching center or a large-capacity Layer 3 switch in the uplink direction via a GbE interface or link aggregation.